Our friends Mark and Monica decided to host a boating day on the lake outside their house. We all turned up in cars and boats and brought picnic food to share. We arrived in the Red Dragon and beached the boat on the shoreline next to the Scanlon house. It was a great day and was made better when Anne Marie turned up. It was her 4oth Birthday and we had been hoping that she would make an appearance. We had made a Birthday Cake and put up birthday banners and balloons. Byron spent most of the afternoon dragging a biscuit behind our boat while different kids jumped in and out. I managed to escape on a catamaran for two long sails and had a ball. I have never been on one before and initially found the concept of needing to be attached to a thin wire with a hook a little disconcerting. I was very glad of my wire on quite a few occasions when I lost my footing and went flying through the air! At one stage Mr B, Paul, David and Simon tried racing us in the Red Dragon and found it a hard job to keep up we were travelling so fast! It was a wonderful day and we were sad to wave goodbye to everyone on the shore but we needed to get back to Styles Point and the car before sundown. Byron drove the boat at a flying pace as the sun set over the lake and we only just got the boat back on the trailer at Styles Point and drove the boat home and up the driveway before darkness really descended. We had so much fun we think the Scanlons should host one every weekend! Joe and Rhonda came for a swim in our new pool today. Cian is a little fish and loved it! He has no fear of the water and splashed and dunked and jumped in off the side (with Joe holding his hands!) He didn't mind being chucked up in the air and laughed every time the water splashed in his face. The kids loved trying to get his attention and were sad to have to get out when they started turning different shades of blue. Hopefully we will have many more fun days with Cian in the pool over the coming years! Byron got a kayak for Christmas this year. Because he works from home he often finds the week passes without him setting foot outside the front door. He hopes to use it during the week as a form of exercise and to help prevent cabin fever. Hopefully he will be able to go for a quick 30 min paddle in his lunchbreak and get fresh air to keep his head clear. Today he went for his first paddle. He walked out the garage door and crossed the road with the kayak in one hand and paddle in the other. A short stroll across the grass and he was at the waters edge. It is a bit muddy at the lakes edge and he did find himself ankle deep in sludge but once he pushed away he had a ball paddling up and down the quiet Secret Bay. Hopefully it will be the first of many such excursions! I've grown tired of hearing this phrase sung out to me be Gareth, Rhiannon, Sian and Byron EVERY time we go near a shopping center. "Mum, can we have a Wii?" No, they're not needing a trip to the loo, just a trip to a computer game shop. Byron has been nudging them to ask again, and again, and again. On Christmas day there was one last gift under the tree with no label. A big box wrapped in shiny red paper. 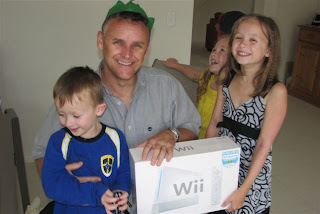 The kids were told to unwrap it together and they shrieked the house down when they saw what was inside. All I have to say is that I played no part in the purchase of this. Joe and Rhonda came up to the lake to spend a few days with Anne and Kel on Boxing day. We waited until then to exchange presents so that we could enjoy each others reactions. Joe and Rhonda had got the kids some pencil cases with their names sewn on. This went down particularly well with Sian and Rhiannon who's Welsh names mean that they very rarely come across things with their names on. One of our favourite reactions was to a toy we bought for Cian. It was a Fisher Price phone that we had had as kids growing up in Dublin. Cian liked it but Joes reaction was so funny, he sat playing with it while we chatted it didn't seem as though much had changed in 30 years! 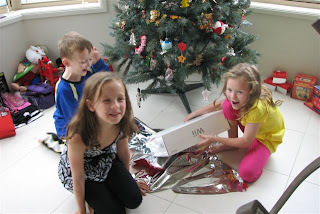 Our third Christmas in Australia began with the giggling of excited kids about 6am! Santa had been and left stockings filled with exciting things for the kids and a big Toblerone bar at the foot of my bed, Thanks Santa!!! The Santa tray was covered in cookie crumbs and there wasn't a drop of Whiskey left in the glass. Outside most of the reindeer water was gone and there was just a carrot stump left behind! 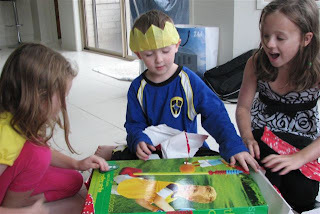 The kids were very excited when they got to their presents and the rest of the morning passed in a blur of ripping paper and talking to Grandparents on the phone. 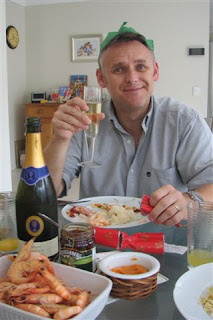 The rest of the day was very chilled out and we vegged and enjoyed all of the presents we had opened. Byron played with , sorry, "helped" Gareth play with his new remote control car and the girls changed in and out of the various new clothes they got! 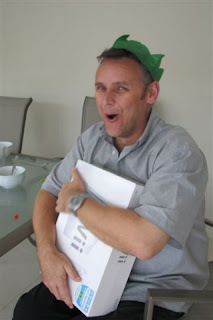 "This was the best Christmas EVER!" We had a lovely Christmas Eve this year. We went to 6pm Christmas Mass. Sian was an Altar Server and Rhiannon got to bring up the bread and wine to the altar with a friend. She looked very prim and proper, no giggling or sticking out of tongues which was good! We went from Mass to Catalina Bay in Rathmines where we were hoping we might see Santa on the Wangi Queen. We pulled up just as the Wangi Queen was coming across the lake to Styles Point. Perfect timing! 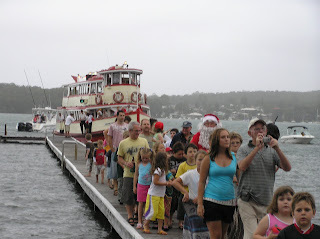 The kids ran along the jetty and got to say Hi to Santa and got a bag of sweets each. We carried on home and checked the Internet to see where Santa was travelling. He was in Russia and the kids started to get really excited. We set up the Santa tray with goodies. 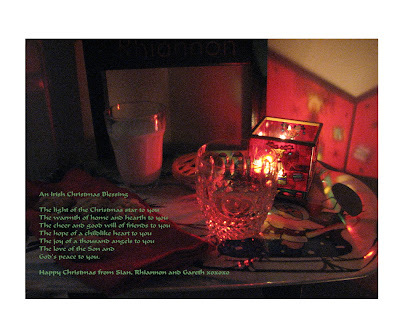 Mince pie, milk, cookies and a glass of Byrons best Whisky. gareth had a last minute cookie just to "test" that they were good enough! The kids went out onto the driveway to sprinkle their reindeer food so the reindeer would know where to land! Off went the kids to bed and Byron and myself did a few last minute jobs then settled in front of the TV with a bottle of Port and watched Bad Santa. This Santa movie (for those who haven't seen it) stars Billy Bob Thornton as a department store Santa with a big drinking habit who detests kids. Definitely NOT a kids film! When the film finished we snuck up the stirs and checked on the kids before heading into our bedroom and waiting for Santa!!!! Rocky Road has become one of our new Aussie Christmas traditions. We made it last year for the first time from a recipe my friend Jane gave me. We felt that to make it truly individual we should make various batches and taste test them. Each batch has had a new ingredient. We made a batch last week and gave it to the teachers and pre-school carers as their goodbye gift. Today's batch is the most decadent yet! ....but were even more excited about "helping" to clean up everything afterwards! I had my exam yesterday. I swotted and swotted, doing numerous on-line test exams. The pass rate is 60% and I was averaging about 75% so I thought I would be OK.
Time taken: 2 mins 51 seconds! I cant remember where I first saw one of these? I was still living at home in Dublin with my parents and think I may have been in my early teens? I remember thinking "I could try that" so off I went to Dunnes Stores with Mum, bought the oranges and cloves and started a Sheeran family tradition of making one of these each Christmas. It is a messy job and the orange juice runs out of the holes that you stab to push the cloves into but it smells GREAT! When the orange is finished you leave it somewhere in the house and the smell continues to fill the room over the holidays. Mum rang me last week and said she had spent all afternoon cursing me. I had no idea what she was on about until she told me she had been making her clove orange and it had been a real messy job! 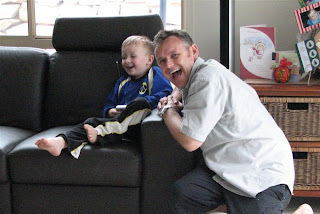 It had me thinking nostalgically of Christmas in Dublin and I decided I would try to do it with the kids. Three big, juicy oranges, three bags of cloves and three "stabbing" kebab sticks later and we were ready! The kids sat around the kitchen table for an hour and stabbed and poked the cloves in place. I thought they would lose patience after a while but they kept on until there wasn't a clove left. The kitchen floor is covered in clove dust and sticky orange juice but it smells great!!! There is a blueberry farm about 15mins drive from us. Last year we went berry picking and had great fun. The blueberries were delicious. We got a phone call to say that this years crop of berries were just becoming ripe enough to pick. It was the first day of the kids school holidays, what better thing to do to fill the day! Off we went and had great fun picking a kilo of berries and then hopped in the car to come home. "What a lovely day" I thought with a nice glow of satisfaction. Having the kids out in the fresh air, picking our own fruit, heading home to bake some blueberry muffins. I nearly crashed the car as Sian let out a blood curdling scream that came close to shattering the car windows. I screamed back "WHAT....?" "LEECH" she screamed "I'VE GOT A LEECH ON MY ANKLE"
I pulled in on the hard shoulder to find that Sian had managed to pull the leech off and we looked at her ankle with a big smear of blood running down her foot. Normally it isn't possible to pull a leach off and you need to use a match or salt or metho. Luckily we think that this leech had only just started to bite and hadn't got a proper hold. We took a few minutes to find the leech (crawling under the passenger seat) Sian put it in an empty container. Now that we were over the fright Sian started to look quite chuffed with herself. Instead of getting home and telling Byron all about the berry picking she went in proudly with her captured leech and tales of her big adventure! 3 more sleeps till Santa! We have finished the shopping. Only a few more presents to wrap. THANK-YOU Paul, Mitch and Shayne !!! At last our pool landscaping is finished! Paul, Mitch and Shayne bust a gut all week working flat out in awful weather conditions trying to complete our back garden in time for the Christmas holidays. They laid pavers around the swimming pool and paved the path from the patio to the pool gate. They worked in torrential rain and scorching heat. Today they finally removed all the left over rubbish from the house build, spread top soil and turfed over all the remaining garden area. ...and just in time for the Christmas New Year break too. 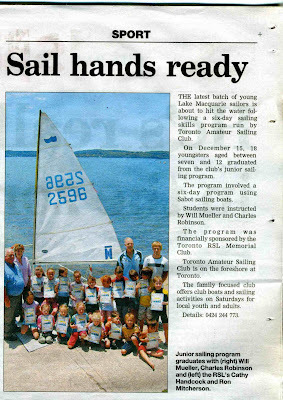 The girls received their sailing awards last Saturday for completing their 6 week sailing course. I was asked to take some photos of the group of kids with their awards in the hope that a local paper might run the story and gain a little more exposure for the club. It worked and a local paper published the photo and a small write up this week!